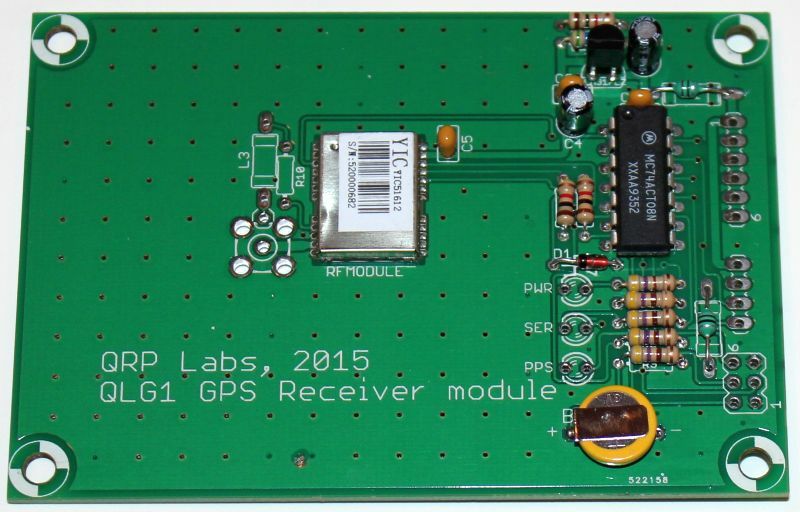 The RF module uses the MediaTek chipset and it is essentially comparable to the QRP Labs supplied SKM61 GPS module. 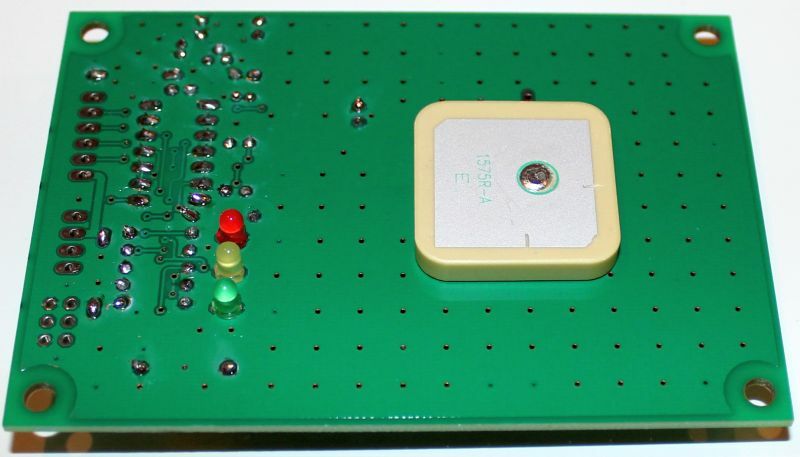 The board size is relatively large (91 x 64mm), this is to provide additional patch antenna gain. Most GPS receiver modules with built-in patch antenna are a compromise between small physical size and sensitivity. If we drop the size constraint, it appears that the antenna sensitivity is optimum with a large patch antenna (25 x 25 x 4mm size is the largest available) and a large 6 x 6 cm PCB ground plane. According to the antenna datasheet the gain is 7.5dBic over that of a 30 x 30mm ground plane. 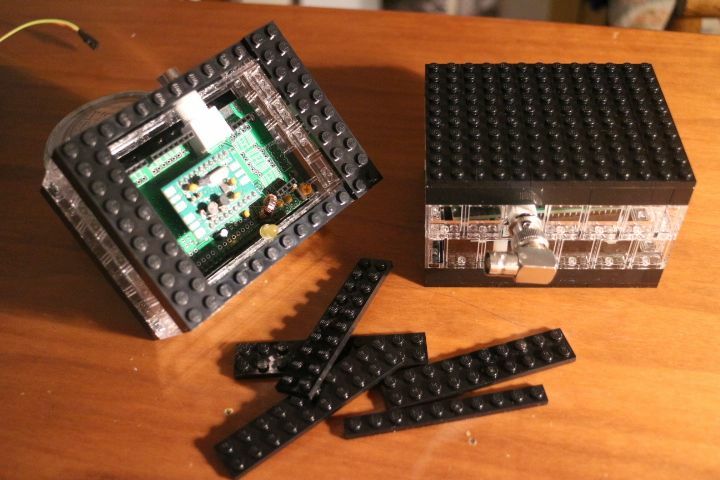 Most small GPS modules are of course smaller than 30 x 30mm. 8) A kit - fun and educational to build! The kit contains the PCB with pre-soldered Mediatek chipset RF module, and all other through-hole leaded components for easy assembly. 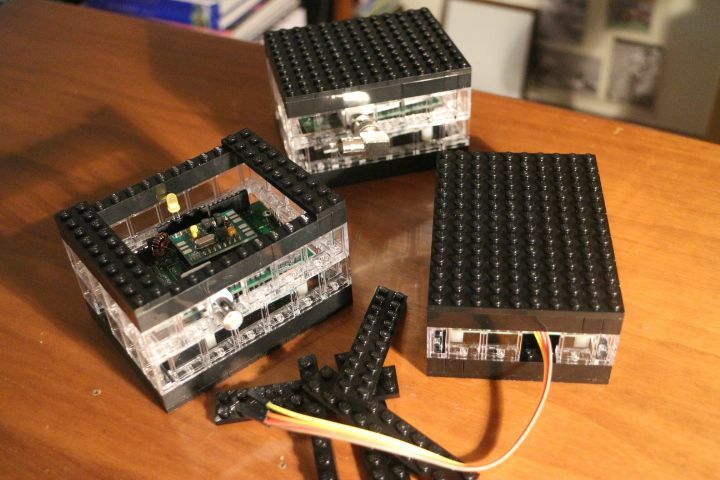 It also includes four nylon 12mm M3 hex spacers and four M3 screws, for mounting the PCB in an enclosure. 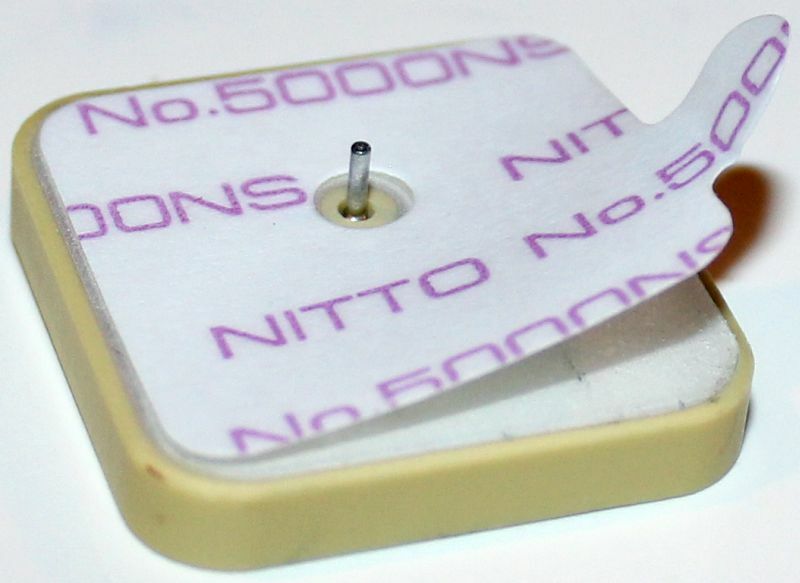 The kit is supplied with a 25 x 25 x 4mm custom-manufactured tuned patch antenna. This is installed on the opposite side of the board to the other components. An SMA connector (not supplied) may be fitted if you prefer to use an external active antenna. A 3V rechargeable battery is included, which backs up ephermeris data and can ensure faster satellite lock after short-term loss of power. (Thanks to Paul AI4EE for the computer-drawn schematic used in the assembly instructions and the French translation). A side-by-side comparison of two U3 kits was made, one connected to the SKM61 and one to the QLG1 GPS receiver (using the U3 GPS Info display feature). On average the QLG1 GPS receiver tracked more satellites than the SKM61 and used more satellites in the fix computation. On average the reported Signal to Noise Ratio (SNR) average was lower, for the QLG1 GPS receiver. This may be because the QLG1 is able to track more satellites, including lower signal strength ones closer to the horizon; this may reduce the average SNR. However I have also read that the "SNR report" numbers are not necessarily directly comparable between different GPS receivers, they are more of a relative measure. More important is that the number of tracked satellites was higher, presumably due to the larger PCB ground plane of the QLG1, as per antenna datasheet. Connection to QRP Labs kits is extremely simple due to the onboard 3.3V regulator and onboard 5V logic level converters. All that is required is a 4-way shielded cable between the Ultimate3S kit (or other) and the QLG1. We recommend a few meters of shielded cable, to keep the GPS receiver away from interference. 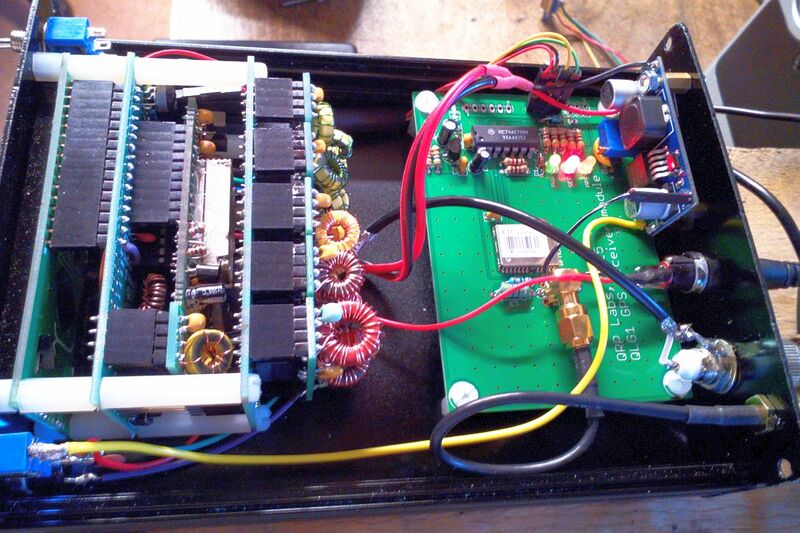 There is no need for regulators, decoupling capacitors or pullup resistors. All of that is already incorporated on the QLG1 board. 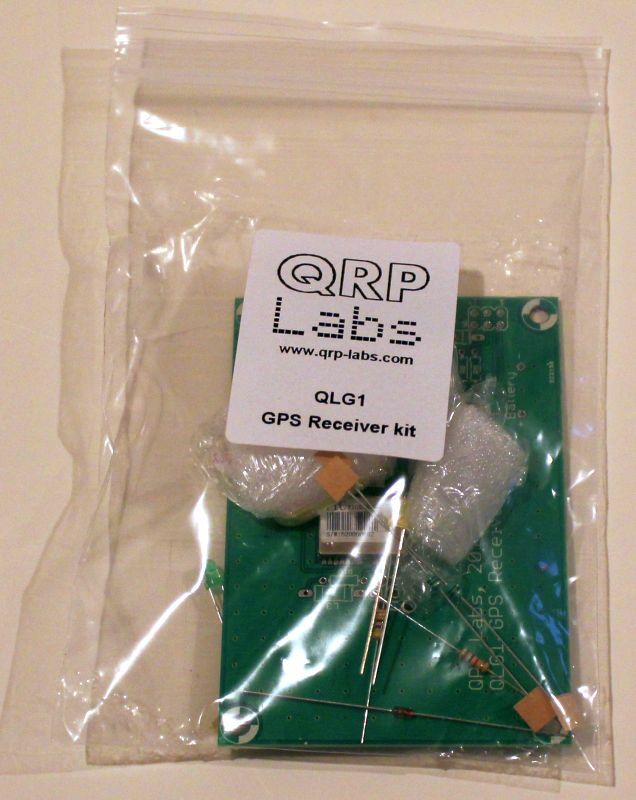 This is the installation of the QLG1 kit with an Ultimate3S QRSS/WSPR kit, with full complement of Low Pass Filters (LPF), and the relay-switched LPF kit, in the official QRP Labs U3 case. Bri is making use of the externally mounted antenna option. He has a short coax with SMA plug on one end and socket on the other, installed from the QLG1 to the back panel. 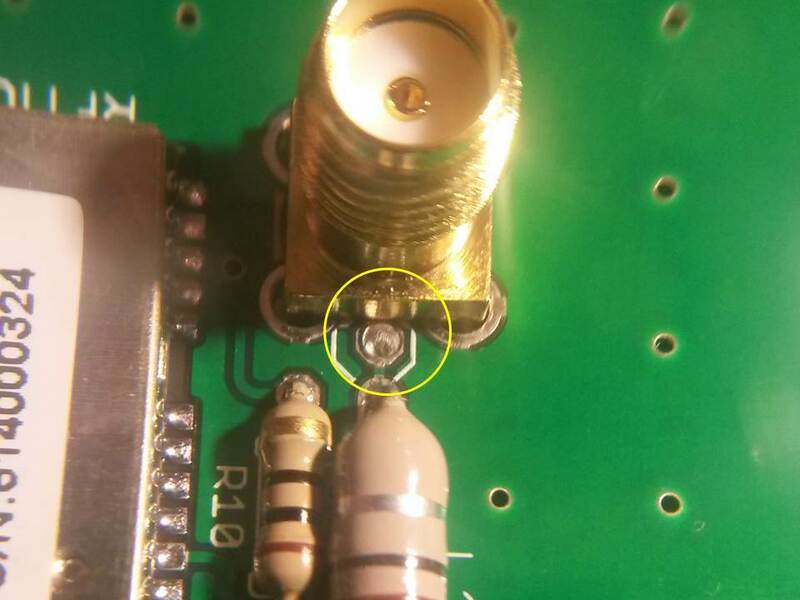 Note that if using the QLG1's onboard patch antenna, you cannot install the QLG1 inside the metal box as this will block signals from reaching the GPS antenna; you should separate the QLG1 from the U3S with a few meters of shielded cable to keep interference away from the sensitive GPS receiver. If the QLG1 is left for a long time unused, the battery might be damaged. It happened in one or two cases I am aware of. The battery retains the downloaded satellite ephemeris data and helps the GPS to achieve a faster lock when powered up (called a "warm" start). The satellite ephemeris data has limited lifetime and in any case in many applications the QLG1 will be used in, such as the U3S kit, and frequency reference projects etc., the unit will be always-on so this feature is not much use anyway. If you get any trouble with the battery, it can be removed. In that case, to get the unit to operate properly, also remove R9 and solder a connection between the + side of C4 and pin 2 of the 6-pin connector (the battery input). 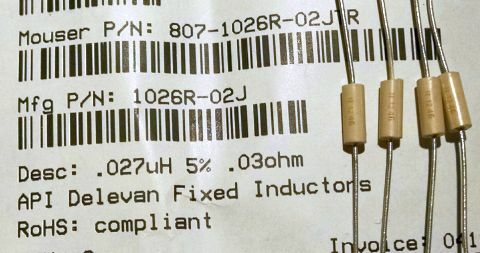 Several people have questioned what choke part number to use for the optional inductor L3 that is used when connecting an external antenna. This inductor really isn't very critical, all it has to do is block 1575MHz, so practically any small inductor with approximately that value or greater, should do fine. But if you want to be precise: Chris K7AZ recommends Mouser Part number 807-1026R-02JTR. 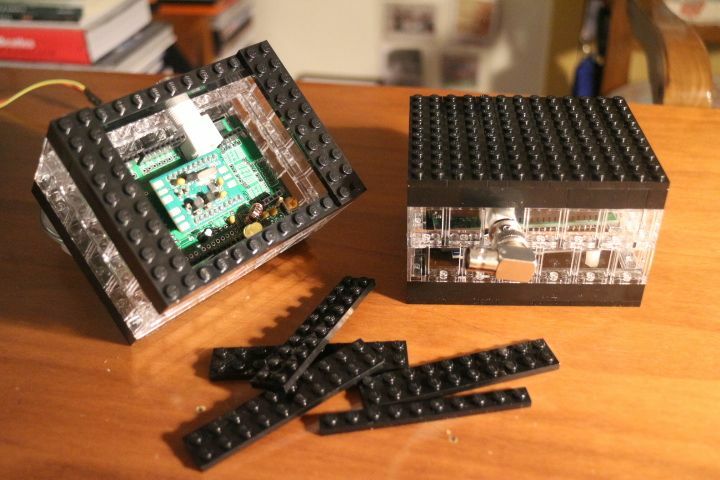 Mario has an interesting solution to the problem of enclosing the Arduino shield kit and QLG1 GPS kit! See photos below! Harald notes that the pad (circled in the photo below) has a high risk of short-circuiting to the body of the SMA socket, when the SMA socket is used for connecting an external antenna cable. 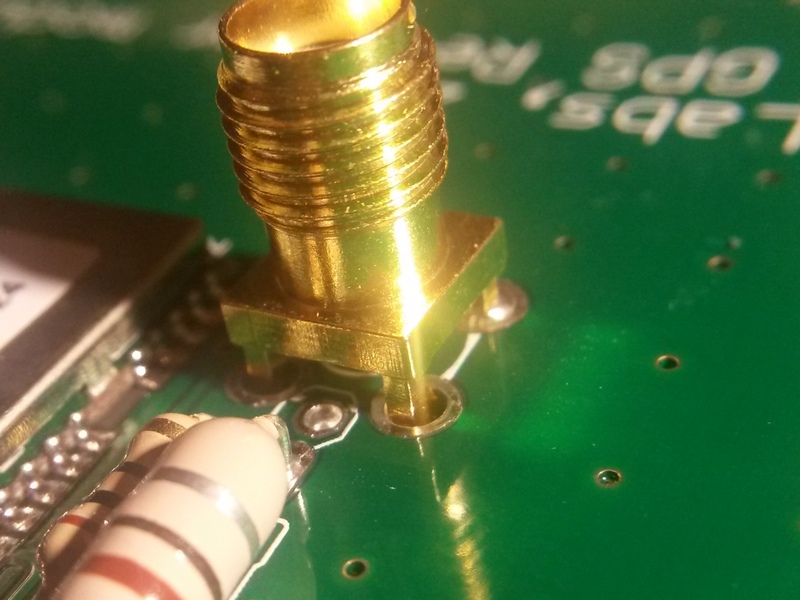 Harald's solution to this problem is to raise the SMA connector slightly away from the PCB. This is an excellent solution and recommended for anyone who wishes to install an SMA connector for an external antenna. The wire of the inductor should be soldered to the centre conductor of the SMA connector, underneath the board. 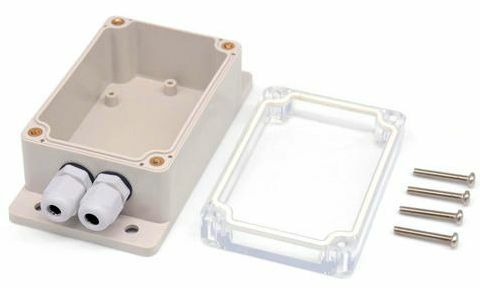 Paul N2EME reports that this IP66 waterproof junction box fits very well with the QLG1 GPS kit. "I just trimmed off 2 of the corner holes as only 2 lined up perfect and there was no need to modify the other two holes."